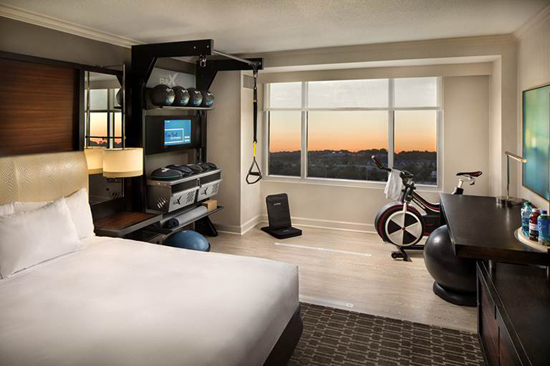 Lancaster, PA, July 27, 2017-Ecore is the exclusive provider of state-of-the-art ergonomic flooring for Hilton Hotels’ new revolutionary “Five Feet to Fitness” program, a new wellness concept that brings more than 11 different fitness equipment and accessory options into the hotel room. Hilton Hotels will install Ecore’s Forest rx product, a flooring solution designed to reduce the risk of injury while mitigating noise and enhancing guest comfort. Hilton’s Five Feet to Fitness concept aims to provide health and wellness-minded guests with the amenities of a fitness center in the privacy of their own rooms – making it more convenient than ever to maintain health routines when traveling. Each of the fitness rooms will have a section covered in Ecore Forest rx flooring to create an ergonomic surface intended to reduce the risk of injury associated with falls and hard impact. “Ecore’s Forest rx flooring is a highly versatile surfacing solution designed to provide good ergonomics, comfort, acoustic benefits, and superior performance characteristics making it an ideal component for Hilton’s Five Feet to Fitness program,” said Virginia Armstrong, Ecore’s director of hospitality sales North America. Ecore’s Forest rx addresses the common risks associated with falls and exercise activities through the use of itstru technology, which combines 5mm of Ecore’s recycled rubber backing with Polyflor’s proven Forest fx surfacing. Ecore’s Forest rx generates a 17 percent force reduction that provides cushioning to absorb impact on athletes’ joints. The attractive flooring also increases sound control so as not to disturb neighboring guests during workout sessions. The Forest rx flooring delivers a comfortable underfoot with anti-fatigue capabilities for a variety of workouts ranging from high-intensity interval training and plyometric exercises to yoga and meditation.